We are so excited to see you in Reykjavik & share a day of food and fun! If you have any questions regarding our tour, it's likely that you'll find your answer here below. But if you can’t find the answer your are looking for, don’t hesitate to shoot us a line. We can easily arrange alternative options for our vegetarian and pescatarian guests and for gluten & lactose intolerants. Nuts, seeds, fruits & shellfish are also easy to avoid. If you have any dietary restrictions or allergies, please let us know in the comment section when you book and we will accommodate you the best we can! Vegans are more than welcome in our tour but unfortunately, the traditional Icelandic cuisine is not very welcoming for a vegan diet. Vegans can unfortunately not enjoy 90% of the cuisines in this tour. Is everything included in the tour or is the food cost separate? Of course! Everything is included in our fun local foodie tour. All you have to do is to show up hungry like a wolf and we will take care of the rest! The tour is really easy as we are always just walking to our next restaurant where we will sit down and enjoy a delicious local cuisine. Furthermore, the walking is usually slow paced as we are exploring the city as we go! Does this tour include sight seeing as a city tour? or is it just food? Absolutely! In our Reykjavik Food walk we visit our favourite restaurants, try all our must try local cuisines and we also walk around all of down town Reykjavik to explore the highlights of and the hidden gems of the city. We explore the main landmarks, beautiful streets and see great street art. We also learn about our Iceland history. This is the perfect way to make the most of your Reykjavik experience in one day. You will hear fun stories and have your local guide show you the best of our hometown – we are also happy to give you any local tips or recommendations you might need. You can book your foodie experience here. We are thrilled of how popular our Reykjavik Food Walk is – but for that same reason, we very often get fully booked far in advance. Can we do a private Food Walk? Yes, it is of course possible to arrange private foodie tours! For groups of 8+ there is no added fee for a private tour. For private groups smaller than 8 persons, we charge the minimum off 97.300 ISK (or for 7 guests). For our 5pm evening departures there is slightly less history and sight seeing and we focus more on creating a fun local dinner experience. The 5pm tour is closer to 2,5hrs. The location is easy to find and very central. It is in walking distance from most hotels, hostels and apartments in Reykjavik. For guests driving their own car, there are multiple paid parking spots nearby – and in a parking garage underneath the building. Absolutely! 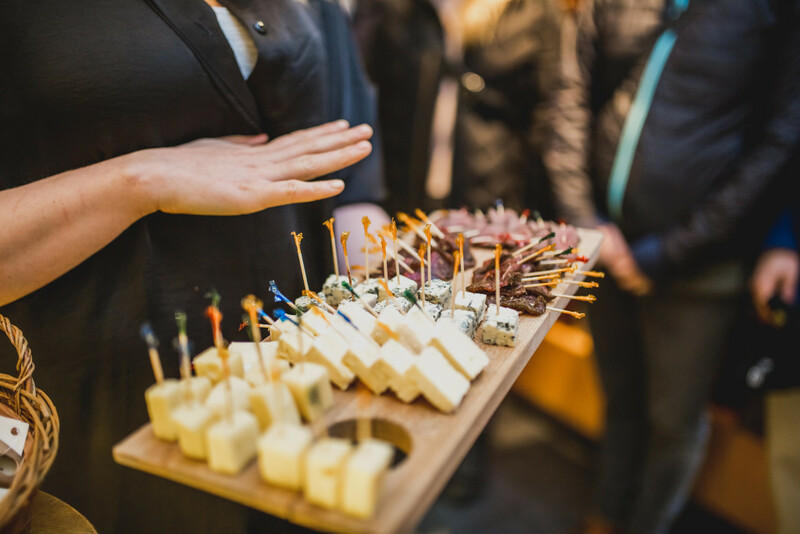 Our Reykjavik Food Tour is specially created to accommodate everyone! Foodies of all ages are welcome. Children under 12 years old get a brilliant 50% discount but still get all of the same cuisines. How many guests are in each group? In our open Reykjavik Food tours we always keep the groups at maximum 10-12 guests. We do this to make the experience as personal and fun as possible! For private groups we can accommodate larger groups, feel free to get in touch! Our philosophy is to offer amazing, fun and authentic Icelandic experiences – And all our team members are not only Icelandic, but local legends. Everything between local rockstars and bodybuilders to students, chefs and engineers! What is the money back guarantee & how does it work? Our highest priority is to deliver a personal, fun & authentic foodie experience in Reykjavik. If you join us on our Reykjavik Food Walk and you aren’t satisfied with your experience, let us know within 30 days and we’ll refund your money back. This guarantee extends to bookings made directly through our website, ReykjavikFoodWalk.com. Unfortunately, we are unable to refund transactions made via third-party sites (Icelandic or international) or because of bad/cold weather. What if my plans change & I need to cancel or reschedule my food tour? Do you offer refunds? We can always reschedule your booking to other available tour departures. 15% booking fee is always non-refundable. Should you choose to cancel your booking with more than 24hrs notice, we will refund you the full 85% of your payment. Reykjavik Food Walk tours cancelled with less than 24hrs are not refundable.